Nokia rumoured a lot that they are coming with Android, yes they didn’t disappointed us. Nokia launched three Android phones Nokia XL, Nokia X+ and Nokia X at MWC 2014 in Barcelona. Nokia XL is the biggest among all running on 5-inch WVGA display with 480×800 pixel resolution. The smartphone is loaded with 1GHz dual core Qualcomm Snapdragon S4 Play processor with 768MB RAM support on 2000mAH battery. Nokia XL sports a 5-megapixel snapper with LED Flash and auto focus, it has 2-megapixel front facing camera. It has 4GB onboard storage which is expandable up to 32GB. It is dual SIM smartphone and supports Micro SIM. Connectivity option includes 3G, Wi-Fi, Bluetooth, GPS and A-GPS. Nokia XL runs on AOSP code corresponding to Android 4.1 overlaid by Nokia’s own tile UI, fastlane experience. Nokia is giving some good softwares like Here Maps which will have offline maps and turn by turn navigation, Nokia MixRadio for free streaming and download playlists. The smartphone is with preloaded apps and games, as it will not have Google Play Store but it will support third party app installation. Nokia XL comes with cloud storage of Microsoft’s One Drive, and one month Skype’s Unlimited World Subscription. 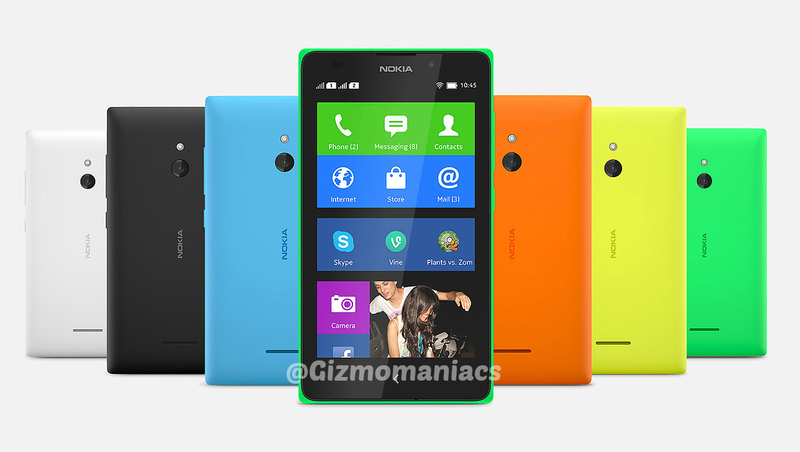 Nokia XL will be available in bright green, orange, cyan, yellow, black and white colours. Nokia XL is priced at 109 Euros (approx. Rs. 9,500) and expected to launched at Q2,2014.